Use these Christmas Essential Oil Diffuser Recipes to create a holly jolly atmosphere in your home this Christmas season! I love the fresh, natural scents that I can bring into my home by using essential oils in my diffuser. If you’re an essential oil fan as well, then you know that there’s something special about using essential oils to scent your home compared to artificially-scented products. It can be a challenge though, to come up with something as good as your favourite Christmas candle so today I thought I’d share some of my favourite Christmas essential oil diffuser recipes. Try out a few of my favourite Christmas essential oil recipes below in your diffuser and let me know what you think! Clove oil, which is used in most of these recipes, is said to have anti-viral capabilities so it’s perfect to diffuse in your home non-stop at this time of year. Just make sure you’re using high quality oils so that you’re getting all the pure goodness that the essentials oil have to offer! These recipes would also be great to try out if you wanted to make scented pinecones! Just follow the same method I outlined in my homemade scented pinecones post! 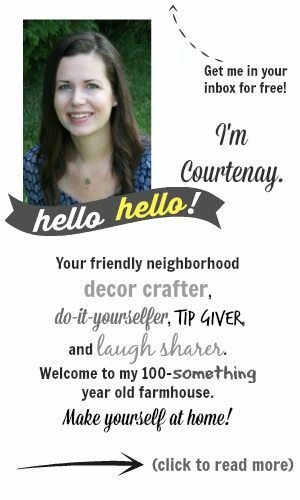 Hi Courtneay, my name is Star,i use oils in my home all the time for shoes,drawers,etc. usually i spend quite alot just for one bottle of good quality i would appreciate the info for the pure oil.for one thing i love your site you always have great advice. Hi Courtenay I love Essential oils but are way too expensive for G.L. and Do—–. LOL You know the ones I mean. I would love you to send me an email and let me know what kind you use. Hey Chris! Just sent you an email. Let me know if you didn’t get it! The essential oils you are using are from Melaleuca the Wellness Company. I recognize the logo, good choice. I’ve never heard of Pure oils. Hi Sandy! You should definitely check out the Pure oils if you get the chance! They’re the best and the prices are very reasonable, which I love. Let me know if you want me to send you some more info! Are these amounts you show enough to put in one of the diffuser containers with the bamboo sticks? I would also love to know where you purchase your oils. I use a company in Texas to purchase my lavender oil which I fill my jars with and add the bamboo sticks .